The Uffizi Gallery, one of the oldest and most famous art museums in the world, is housed in the Palazzo degli Uffizi, a palazzo in Florence, Italy. 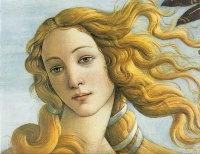 Its collection houses Piero di Cosimo's Perseus Freeing Andromeda, Sandro Botticelli's The Birth of Venus, Titian's Venus of Urbino, Caravaggio's Medusa and a typical example of grotesque ceiling paintings. Building of the palace was begun by Giorgio Vasari in 1560 for Cosimo I de' Medici as the offices for the Florentine magistrates — hence the name "uffizi" ("offices"). Construction was continued to Vasari's design by Alfonso Parigi and Bernardo Buontalenti and ended in 1581. The cortile is so long and narrow, and open to the Arno River at its far end through a Doric screen that articulates the space without blocking it, that architectural historians treat it as the first regularized streetscape of Europe. Vasari, a painter as well as architect, emphasized the perspective length by the matching facades' continuous roof cornices, and unbroken cornices between storeys and the three continuous steps on which the palace-fronts stand. The Palazzo degli Uffizi brought together under one roof the administrative offices, the Tribunal and the state archive (Archivio di Stato). The project that was planned by Cosimo I, Grand Duke of Tuscany to arrange that prime works of art in the Medici collections on the piano nobile was effected by Francis I of Tuscany, who commissioned from Buontalenti the famous Tribuna degli Uffizi that united a selection of the outstanding masterpieces in the collection in an ensemble that was a star attraction of the Grand Tour. Over the years, further parts of the palace evolved into a display place for many of the paintings and sculpture collected by the Medici family or commissioned by them. After the house of Medici was extinguished, the art treasures remained in Florence by terms of the famous Patto di famiglia negotiated by Anna Maria Lodovica, the last Medici heiress; it formed one of the first modern museums. The gallery had been open to visitors by request since the sixteenth century, and in 1765 it was officially opened to the public. Because of its huge collection, some of its works have in the past been transferred to other museums in Florence — for example, some famous statues, to the Bargello. A project is currently underway to expand the museum's exhibition space by 2006 from some 6,000 metres² (64,000 ft²) to almost 13,000 metres² (139,000 ft²), allowing public viewing of many artworks that have usually been in storage. In 1993, a car bomb exploded in Via dei Georgofili and damaged parts of the palace, killing five people. The most severe damage was to the Niobe room, the classical sculptures and neoclassical interior of which have been restored, although its frescoes were damaged beyond repair. The identity of the bomber or bombers are unknown, although it was almost certainly attributable to the Sicilian Mafia who were engaged in period of terrorism at that time. Today the Uffizi is one of the most popular tourist attractions of Florence. In high season (particularly in July), waiting times can be up to five hours. Visitors who reserve a ticket in advance have a substantially shorter wait. In the summer 2007, in early August, Florence was caught with a large rainstorm, and the Gallery was partially flooded, with water leaking through the ceiling, and the visitors had to be evacuated. 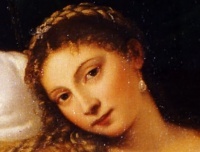 The Uffizi also may be referenced in the chorus of the song "You Enjoy Myself" by Phish, although the band has famously neither confirmed nor denied the exact lines of the song's chorus. Between 1579 and 1581, the 46 ceiling bays of the east wing corridor were decorated with frescoes of grotesques by Antonio Tempesta, then Alessandro Allori, who collaborated with Ludovico Buti, Giovanni Maria Butteri, Giovanni Bizzelli and Alessandro Pieroni. Among these grotesques is Grotesque with Satyr. Unless indicated otherwise, the text in this article is either based on Wikipedia article "Uffizi" or another language Wikipedia page thereof used under the terms of the GNU Free Documentation License; or on original research by Jahsonic and friends. See Art and Popular Culture's copyright notice. This page was last modified 11:59, 16 December 2017.